1X/2X - $46.99 Only 2 left! 3X/4X - $46.99 Only 1 left! Everyone has different Halloween priorities. A child's agenda centers around strategic neighborhood candy routes to score the best treats. Typically, teens and young adults want to attend the most epic costume party while doting moms and dads prefer wrapping their adorable newborns in a delightful character bunting. If you don't fall into one of these neatly defined groups, don't feel bad because Halloween is all about diversity. Celebrate the way you want, even if it means bobbing for apples in a bucket of chilled Pinot Grigio or taking a mighty Merlot gulp every time the doorbell rings. Wearing this 'more boos' Halloween dress hints at your spooktacular plans in the most tongue-in-cheek way possible. If your gal pals show up with wine glasses in hand instead of treat bags, you'll know they got the message! This swing-style dress is specifically designed for stylish plus size women looking for a cute costume alternative this Halloween. 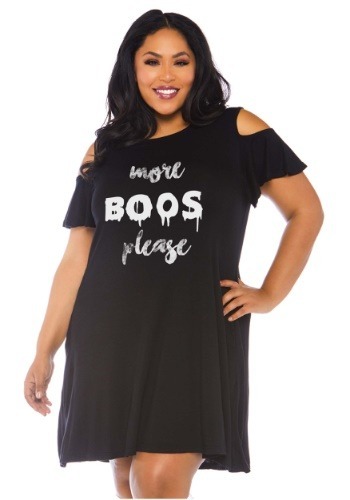 Made from comfortable and loose-fitting jersey fabric, this LBD features trendy shoulder cutouts, flouncy short sleeves, and the playful phrase, "more boos please" clearly printed on the front. All that's needed to complete the look is your sassy attitude. Pick up comfy jersey dresses for every single boozy bestie on your squad. We also sell a gray 'basic witch' jersey dress similar to this one for ladies who'd rather celebrate with an iced chai latte instead of a glass of wine.